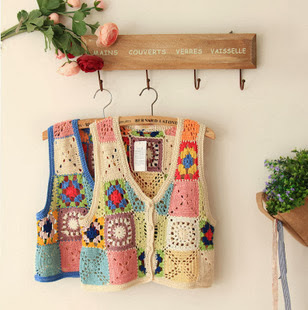 These stunning granny square vests can be found on a website from China, as far as I can tell. But if you read the words on the recycled wooden peg rail, then they appear to be French made/designed... maybe. They are, unfortunately, sold as is, and not as a crochet pattern ! However, it should be very easy to take apart the principles of the design and add your own colour scheme, then et voila ! You have your own beautiful patchwork style vest /waistcoat. I'm so inspired by these, I think I will have a go at something similar in the new year - for babies !